The Dalai Lama has been awarded a Congressional Gold Medal - the top US civilian honour - in a move that has infuriated China. George W Bush attended the ceremony in Washington, the first time a sitting US president has appeared in public with the exiled Tibetan leader. Chinese state media had warned it would "cast a shadow" over ties with the US. Beijing has been accused of human rights abuses in Tibet, which its communist troops occupied in 1951. Mr Bush led the 72-year-old Buddhist leader into the Capitol Rotunda, holding his hand as they entered before sitting side-by-side. As he presented the medal, Mr Bush hailed the Nobel Peace Prize winner as a "universal symbol of peace and tolerance". 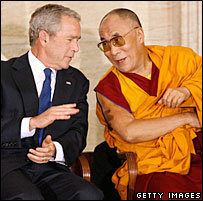 "I will continue to urge the leaders of China to welcome the Dalai Lama to China," Mr Bush said. "They will find this good man to be a man of peace and reconciliation." He said the US could not close its eyes to the plight of the religiously oppressed. 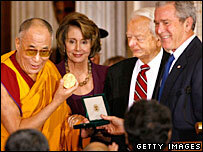 The Tibetan leader said he was "deeply touched" to receive such a "great honour". "I believe that this award also sends a powerful message to those individuals who are dedicated to promoting peace," the Dalai Lama said. Mr Bush met the Dalai Lama behind closed doors on Tuesday in the White House residence, rather than the Oval Office, out of deference to China. It was their third private meeting in six years. But Wednesday's elaborate ceremony was a much more public affair. Beijing described it as a "gross interference in China's internal affairs". "China is strongly resentful of this and resolutely opposes it," foreign ministry spokesman Liu Jianchao was quoted by the official Xinhua news agency as saying. An editorial in the official China Daily newspaper said: "This event will certainly cast a shadow over the relations." Beijing has long argued the Dalai Lama is seeking to destroy China's sovereignty by pushing for independence for devoutly Buddhist Tibet. He insists he wants "real autonomy", not independence for the region, which Beijing claims is an "inalienable" part of China. Analysts say it is a delicate diplomatic balancing act for Mr Bush, who needs China's help to manage nuclear standoffs with Iran and North Korea. Meanwhile, China's Communist Party, which is holding its 17th Congress this week, is highly sensitive to potential embarrassment as it prepares to stage next year's Olympics. US lawmakers regularly accuse Beijing of turning a blind eye to alleged human rights abuses in Burma and Sudan in its pursuit of energy and business deals. The Dalai Lama has also met Austrian Chancellor Alfred Gusenbauer and Australian Prime Minister John Howard this year, and is due to meet Canadian Prime Minister Stephen Harper later this month.